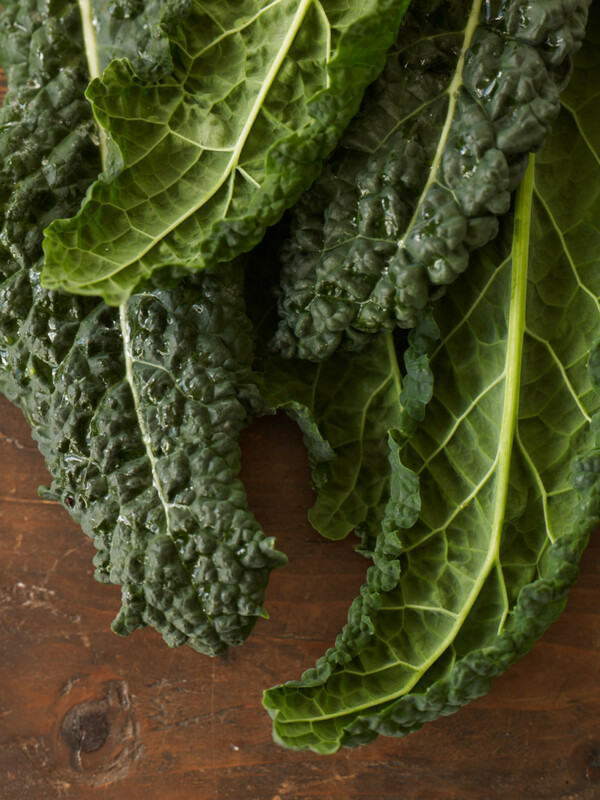 Cavolo nero is an excellent green vegetable to get acquainted with. It’s a bit different to other cabbages because it doesn’t form a head (you know, grow into a ball!). It grows about 1 metre high (about 3 feet) and the dark bluey-green crinkly leaves fan out like plumes and curl over at the tip. It’s quite majestic. Just like Brussels sprouts, another brassica family member, cavolo nero improves with a touch of frost, becoming firmer, crisper and sweeter to taste. The leaves are generally too tough to eat raw and the thick ribs need to be discarded, although baby leaves taken from the centre of the plant can be added to a salad or quickly stir-fried. Use a sharp knife and run it down either side of the rib to easily free the leaves. Cook chopped leaves in boiling salted water for 7–12 minutes, depending on the maturity of the leaves and whether the cavolo is to be cooked again. Drain, press or wring gently to extract excess water, then finish off as called for in the recipe. An easy way is to reheat cooked chopped cavolo nero in plenty of extra virgin olive oil with either garlic, chilli, fennel seeds or black olives, or two or three of these strongly flavoured ingredients at a time, or all of them! Anchovies, nutmeg, sage and parmesan cheese are other assertive ingredients which can all match its robust character. Butter, cheese and cream add unctuousness, making it more palatable and satisfying to eat, but sizzling bacon fat with its smoky salty hit is a personal favourite. Cavolo nero is quite bulky, even after cooking, and adds structure to a dish. It somehow seems made for mash – whether it be a cheesy fluffy potato mash, a slightly sweet mash of carrots and parsnips or a firmer coarse-grained mash of polenta enriched with lashing of butter and parmesan. All you need on the side is a good sausage or two and a spoonful of an onion or tomato sauce and you’ve got one of winter’s great meals. To give it a bit more oomph, pound 2-3 anchovies then mix with extra virgin olive oil and toss through hot cooked cavolo nero. Another idea is to serve it on top of cheesy polenta with grilled or baked mushrooms and crisp fried rashers of bacon. All these ways are delicious. It’s also an excellent addition to soup adding an earthy nutty flavour while giving texture and colour, and of course enriching it with all its goodness (cavolo nero, like cabbages and kale, is highly nutritious). Ribollita is the classic Tuscan vegetable soup of cannellini beans, tomatoes and vegetables and ‘black cabbage’ (cavolo nero). It improves when rested overnight and reheated the following day (hence the name ribollita, meaning re boiled). Although crinkly dark-leaved Savoy cabbage can be used in ribollita in place of cavolo nero, when the soup is reheated it tends to give off a bit more of that sulphury smell we’ve come to detest with reheated cabbage. Cavolo nero can also be used in pasta sauces. Try sizzled cubed bacon or pancetta and cooked chopped cavolo nero bubbled gently with cream served over chunky short pasta such as penne. And it’s great on bruschetta. Make a nicely oiled and garlicky slice of bruschetta and put on plenty of cooked shredded cavolo nero tossed in sizzling butter, season with freshly ground black pepper and grated nutmeg, and top with a poached or lightly fried egg and shavings of parmesan cheese. Nothing wrong with that for supper! Cavolo nero is not a long keeper. Buy it spanking fresh – it should almost feel bouncy – store in an open-ended plastic bag in the vegetable crisper and use within 3–4 days. Try this on a chilly night – it'll warm you down to your boots!